20 | TH E M R EP O RT KEYSTONE AWARD RECIPIENTS THE RISING BUSINESS LEADER AWARD RECIPIENT T he Rising Business Leader Award, which recognizes young women leaders who, while still early in their careers, have dem- onstrated an outstanding capability to lead and drive progress. 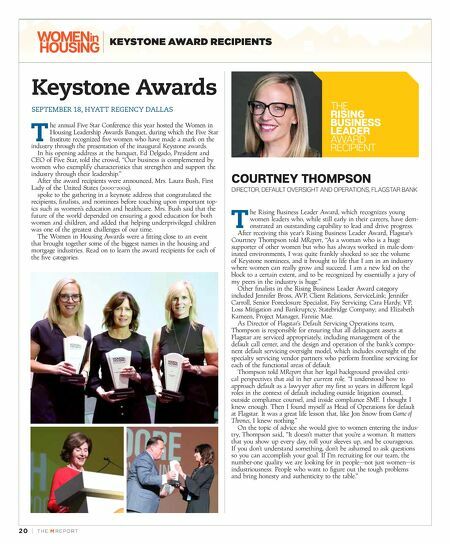 After receiving this year's Rising Business Leader Award, Flagstar's Courtney Thompson told MReport, "As a woman who is a huge supporter of other women but who has always worked in male-dom - inated environments, I was quite frankly shocked to see the volume of Keystone nominees, and it brought to life that I am in an industry where women can really grow and succeed. I am a new kid on the block to a certain extent, and to be recognized by essentially a jury of my peers in the industry is huge." Other finalists in the Rising Business Leader Award category included Jennifer Bross, AVP, Client Relations, ServiceLink; Jennifer Carroll, Senior Foreclosure Specialist, Fay Servicing; Cara Hardy, VP, Loss Mitigation and Bankruptcy, Statebridge Company; and Elizabeth Kameen, Project Manager, Fannie Mae. As Director of Flagstar's Default Servicing Operations team, Thompson is responsible for ensuring that all delinquent assets at Flagstar are serviced appropriately, including management of the default call center, and the design and operation of the bank's compo - nent default servicing oversight model, which includes oversight of the specialty servicing vendor partners who perform frontline servicing for each of the functional areas of default. Thompson told MReport that her legal background provided criti - cal perspectives that aid in her current role. "I understood how to approach default as a lawyyer after my first 10 years in different legal roles in the context of default including outside litigation counsel, outside compliance counsel, and inside compliance SME. I thought I knew enough. Then I found myself as Head of Operations for default at Flagstar. It was a great life lesson that, like Jon Snow from Game of Thrones, I knew nothing." On the topic of advice she would give to women entering the indus - try, Thompson said, "It doesn't matter that you're a woman. It matters that you show up every day, roll your sleeves up, and be courageous. If you don't understand something, don't be ashamed to ask questions so you can accomplish your goal. If I'm recruiting for our team, the number-one quality we are looking for in people—not just women—is industriousness. People who want to figure out the tough problems and bring honesty and authenticity to the table." COURTNEY THOMPSON DIRECTOR, DEFAULT OVERSIGHT AND OPERATIONS, FLAGSTAR BANK Keystone Awards SEPTEMBER 18, HYATT REGENCY DALLAS T he annual Five Star Conference this year hosted the Women in Housing Leadership Awards Banquet, during which the Five Star Institute recognized five women who have made a mark on the industry through the presentation of the inaugural Keystone awards. In his opening address at the banquet, Ed Delgado, President and CEO of Five Star, told the crowd, "Our business is complemented by women who exemplify characteristics that strengthen and support the industry through their leadership." After the award recipients were announced, Mrs. Laura Bush, First Lady of the United States (2000–2009), spoke to the gathering in a keynote address that congratulated the recipients, finalists, and nominees before touching upon important top - ics such as women's education and healthcare. Mrs. Bush said that the future of the world depended on ensuring a good education for both women and children, and added that helping underprivileged children was one of the greatest challenges of our time. 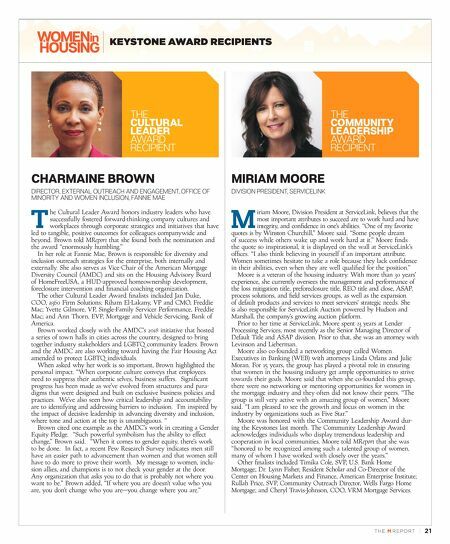 The Women in Housing Awards were a fitting close to an event that brought together some of the biggest names in the housing and mortgage industries. Read on to learn the award recipients for each of the five categories.